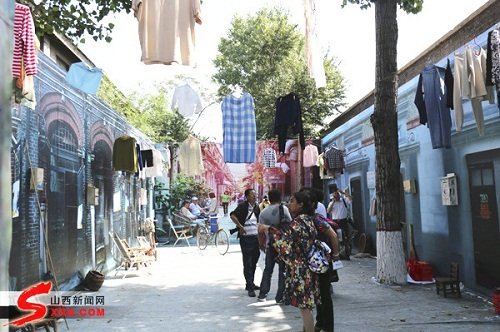 In a typical Shanghai-style neighborhood or longtang, old people sit on chaise lounge chairs chatting with each other, while women in traditional silk qipaos gently wave fans, enjoying a relaxed way of life. However, it is not a real longtang in Shanghai, but a 3D photography exhibition by Qin Jun at the 17th Pingyao International Photography Festival in North China's Shanxi province. 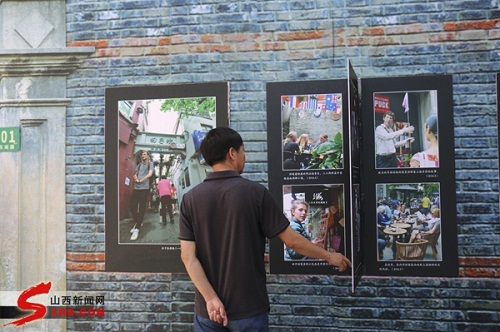 Named The Fading Longtang in Shanghai, the work consists of a large number of longtang photos and various longtang-style items, such as mailboxes, bamboo chairs and old-fashioned clothes, which were collected by the photographer from Shanghai. "I started taking longtang photos four years ago," said Qin. It was on a business trip to the metropolis that he found that the distinctive architectural feature of contemporary Shanghai was on the verge of extinction. "In a period of rapid development, many longtang neighborhoods are being replaced by high-rise buildings," Qin added. "As a photographer, I feel responsible for helping keep an important part of local culture alive to educate more people about it," he explained. He never imagined that his work would be so popular in the Ancient City of Pingyao. "The international photography festival has provided a good opportunity for me to learn and help me realize my dream," said Qin.